The Times ran a feature on the pedestrian crush in New York City today, and as good as the photos are, they don’t do the situation justice. To get a sense of just how inadequate the sidewalks are in Midtown, you need to go there — or failing that, watch this Streetfilm from 2009 with narration by Streetsblog publisher Mark Gorton. Believe it or not, these scenes of people overflowing off the sidewalk were shot during a post-recession ebb in pedestrian traffic, according to DOT counts cited by the Times. Since this video was made, the crowding has actually gotten worse. Mistakes made a hundred years ago reverberate in entirely new ways today. Without wider sidewalks, the protected bike lane network will continue to break down in the heart of Midtown. What New York needs now is to take entire lanes reserved for motor vehicles in Midtown and repurpose them for wider sidewalks. Enjoy the Independence Day weekend, Streetsblog readers. We’ll be off Monday and back to publishing on Tuesday. We could start by pedestrianizing Broadway between Columbus Circle and Union Sq. Then Lexington Ave in Midtown. With sidewalk expansions on the other Aves and pedestrianized streets where necessary. There’s several opportunities throughout the entire city. Just do it. The honking in Manhattan can’t get any worse. We shot that video a l-o-n-g time ago. I was there a few years ago and it seemed twice as bad. Now at that same intersection? I wonder if it has gotten even worse? Probably. Broadway pedestrianized linking Union Square, Madison Square, Herald Square, Times Square, Columbus Circle, and Central Park is a idea long overdue. Fifth Avenue at least from 57th to 34th could also be pedestrianized with 2 bus lanes running down the middle similar to the pre-1909 configuration. There are also dozens of crosstown streets in Midtown that could be pedestrianized. Unsourced. Unsubstantiated. “No choice?” Last bus to Jersey is 5:55? Very cynical manipulative reporting by the paper of record. Ben Fried for Mayor!!!!! yes that is what we need… we need to start with 7th and 8th avenue and 42nd street all round transportation hubs. Pennsylvania is a town in Jersey now? Get rid of those stupid bike lanes, then simply widen the sidewalks so more can/will walk. PA or Jersey same difference. You outlanders have such an attitude. The irony was that the accountant who lacks basic counting skills, along with many of his cul de sac dwelling peers, walks in the 8th Avenue bike lane to beat the crowds. Instead of getting rid of bike lanes why don’t we get rid of curbside parking? We can start with getting rid of curbside parking on the avenues and go from there. A slippery slope, for getting rid of curbside parking could cause a retail store uproar particularly now that with less meters hard to simply feed the meter so therefore now can have a higher retail shop visitor/buyer turnover. Of course, FREE to travel [pollution and noise free electric] trams on the street level would boost business and tourism beyond one’s imagination, IMHO. 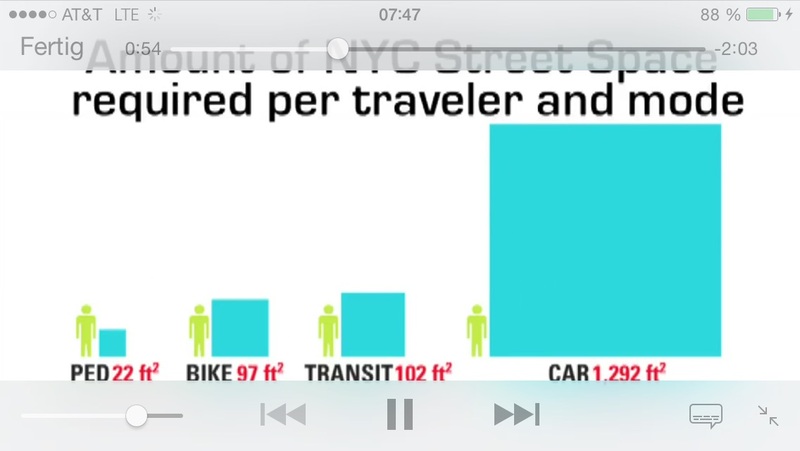 Bottom line is that particularly tiny Manhattan, based upon a grid system, is simply too small to accommodate so many pedestrians given the sky high vertical buildings that take no account of how much horizontal pedestrian traffic will occur at street level because of so many people housed, working and visiting vertically. As for your absurd suggestion that Manhattan doesn’t have enough space for pedestrians, if that’s true it’s only because of the grossly disproportionate amount of space allotted to private vehicles. My corp. owns multiple dwellings, wherein, technically and legally, I am not personally a NYC/NYS resident and spend far less than half a year in NYC or NYS. Saying that, park a corp passenger vehicle on upper east side, in a garage, for the bargain basement price of $500@mo, as price, in a free enterprise vs. socialist appeal to lowest common denominator system, rations such assets as rare parking spaces. So have little use for curbside, take a combo of public and private transportation to and from wherever. Eliminating curbside parking is not an answer, such control best be accomplished by a fee based permit ration system, wherein corporate [is an artficial person according to the law] or personal residency basis the vehicle registration takes precedent, as in sections of other U.S. major cities, or use a variation of such permits. Add in London-style fee based road travel automated tolls in designated areas and should cut down on traffic. As for bike lanes, they are so abused by bicyclists that they pose a significant pedestrian risk as well as vehicular collisions upon turning corners as NO bicyclist ever obeys traffic signs or signals. Add in that they are rarely utilized in many locations, e.g., upper east side wherein most often you can count just one or two bicycles per hour so traveling in the designated lanes, and sometimes none for hours! Broadway almost completely *is* pedestrianized between Columbus Circle and Union Square. It’s single lane a large portion of the way. Also, third avenue south of the tunnel is having one lane in each direction removed. Astor Place is undergoing a gigantic makeover that is cutting out multiple roads and dramatically increasing pedestrian area. These changes are happening, it just takes a long time to do this stuff. Nobody visits retail stores in Manhattan by *private car*. That would be insane. You take a taxi (or Uber) or you take the subway. Or you walk. Each numbered Avenue shall have two traffic lanes removed, and the sidewalks shall be widened by one lane-width on each side. Initial work shall progress from 14th Street north and shall continue until work has reached 125th Street. At all intersections, curb bulb-outs will be provided for cross-streets. The sidewalks on cross streets shall be widened on 14th, 23rd, 34th, 42nd, 59th, 66th, 72nd, 79th, 86th, 106th, 110th, 116th, and 125th Sts, by removing moving lanes or parking lanes as needed. Subsequent phases of work will identify additional locations in need of sidewalk widening. Even in just visiting NY, I’ve seen overcrowded sidewalks as far north as 125th St. So I think it really needs to be done all the way along the island. It’s subtle but similar to the crash vs. accident language adjustment; we should start giving primacy to Humans instead of motor vehicles in our language. These 3 pictures are not taken in the same exact perspective, something that is noticeable tracing the building outlines side-by-side. A nearly incredible over 800 plays on this old Streetfilm with Mark since you re-posted it! Very nice. Do you know how this was calculated? Eliminating curbside parking is very much an answer. Whether or not it’s the best one depends on the particular circumstance, but not only does getting rid of parking free up a ton of space for wider sidewalks or bike lanes (or, better, both), but it discourages people from driving as well. The Lexington and 89th photos are fascinating. It appears the total sidewalk width shrank by about a third, but the effective width today is even more constrained because street trees were added within the pedestrian space. Also noteworthy is that much of the additional roadway space actually came from cutting back the stoops. Plus the change in elevation of the street is striking! 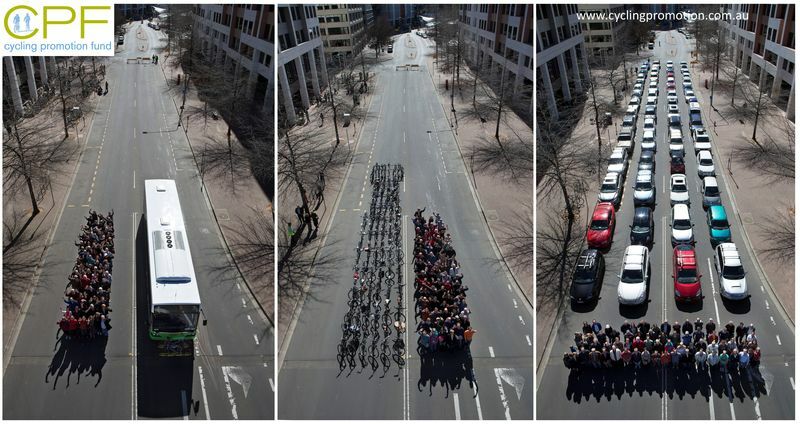 It should be noted that the perspective of the photographs does tend to exaggerate the difference. In the old photo, the view is straight down the sidewalk. Looking down the parking lane with an oblique view of the sidewalk nicely emphasizes the current use of the same space, but makes the sidewalk look even narrower than it would with a straight-on view. I was happy to see some comments on the NYT article showing that people understand the problem, the solution, and the fact that the sidewalks used to be much wider. Intentionally or not, the second half of the article suggests the reason we need more sidewalk space is to clear the bike lanes. “Get those pesky pedestrians out of the bike lanes”… Sidewalks and pedestrians are worthy of their own space. If you are looking to elaborate on a side effect of lack of sidewalks, I might suggest focusing on the safety benefits to be had. If people aren’t using the bike lanes, could it be because there are pedestrians, double-parked cars, and taxis take up the space? It makes biking dangerous because people don’t respect the bike lane. I visit NYC often, but I live in Minneapolis. We have bike lanes everywhere and they are used heavily. But when non-bicyclists are in the bike lanes it causes problems and is dangerous. That is one of the reasons that bicyclists don’t obey traffic signs or signals. Even with a jersey barrier or some other solid protection biking next to a travel lane can be pretty stressful. A ten foot buffer is nice. But if it’s parked cars you have to watch out for doors. Or if it’s stopped trucks/buses you have to watch out for people coming out from behind a blind corner. Which is better depends on traffic speed, degree of protection (jersey barrier > flexible pylons > paint), probably some other factors you could come up with too. When walking there are fewer downsides to being next to stopped vehicles, though tall vans and trucks near intersections are a problem. 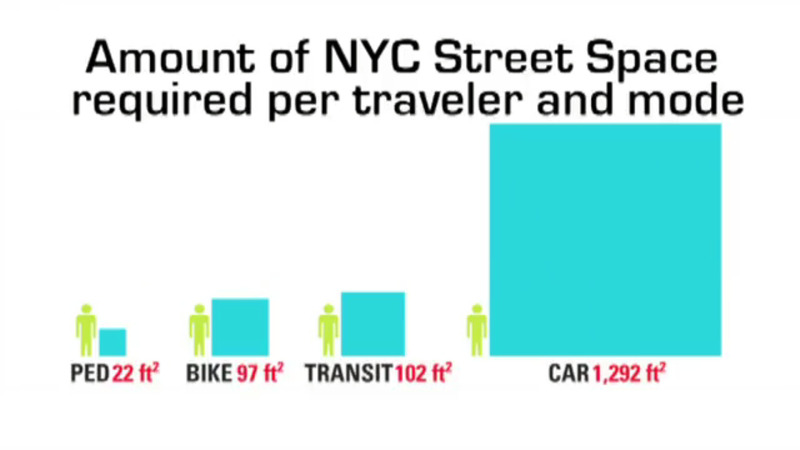 I figure it’s mostly just an issue of different speeds between walking and biking. Instead of eliminating a parking lane for pedestrian and cyclist space sometimes it’ll make more sense to eliminate a travel lane. Maintaining a space for motor vehicles to stop has benefits, though of course those benefits aren’t always the highest use of the limited space. Sometimes use the parking lane for bus/commercial vehicle bays, taxi stands, five minute pick up/drop off spots (camera enforced, fee of $1 a minute beyond five plus some base administrative fee), bike corrals etc…There are likely some spots where eliminating the travel lane would have no impact on motor vehicle throughput (let’s face it, that still matters) if the new parking lane turns into a turning lane where the old one did not. Elsewhere, since this isn’t a travel lane, it doesn’t have to be continuous, pedestrian islands like you see by parking protected bike lanes at some intersections can be helpful too. Like you said, it depends on the circumstances. In the case of the Midtown crosstown streets, I think most are heavily used for truck deliveries to the various buildings. Right now, unfortunately, the trucks typically double-park, drive on the sidewalk, etc. A more formal redesign of these crosstown streets so that they have proper loading zones for trucks, and are designed primarily for truck loading and for pedestrians, would be great. hour. and $200 for the second hour, $400 for 3rd hr, $800 for fourth hour. these rates would be 24/7 365 days a year.